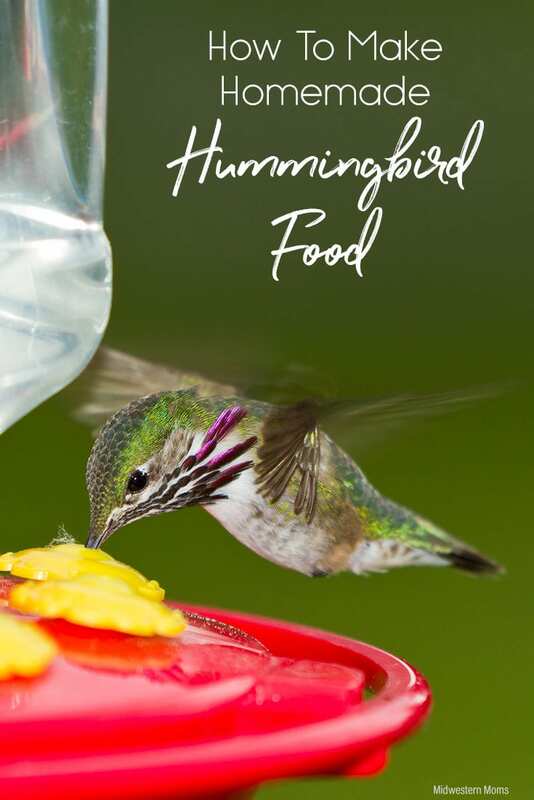 Did you know you could easily make your own hummingbird nectar? 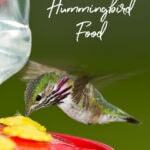 I show you how to make homemade hummingbird food with 2 items that you have in your home already! Now that Spring is finally here in Missouri, that means the hummingbirds will be migrating back soon. I look forward to this time of year. I love seeing hummingbirds zipping around from flower to flower and our feeder. The first year we started feeding the birds, there was one pair. Last year we had two pairs. Hopefully this year we will have more coming to visit us. I have been thinking about adding a new feeder to our yard. The hummingbirds seem a bit territorial of our one feeder so another one may be in order.
. I only recommend this since the feeder is outside, the sun and weather can take a toll on the feeder. I don’t like to use plastic ones because as the sun heats the feeder, it could leach some of the plastic into the food. If you are using tap water, boil water to remove all impurities. After the water has cooled, measure the water again to make sure you have not lost too much water. The ratio needs to be 1 part sugar to 4 parts water. Add the sugar water to your feeder and hang outside for the birds. NEVER use red dye!!! The birds will be able to find the feeder without the red color. You can use a glass feeder that has red glass. Unused food can be stored in the refrigerator up to one week. Always check for fermentation before using stored food. 1. If you choose to use tap water, make sure you boil it first. Boiling will help remove impurities in the water. Also, make sure it is completely cooled before adding it to your feeder. Hot nectar could damage the feeder by causing cracking or warping. 2. Store unused hummingbird nectar in the refrigerator. You can store the food in a refrigerator for up to one week. 3. Only use white granulated sugar. Never use brown sugar, molasses, or sugar substitutes to make their food. These types of sugars are hard for the hummingbird to digest. Plus, they will ferment faster than white granulated sugar. 4. Refill the hummingbird feeder at least once a week. Keeping the food fresh in the feeders is important. Sugar water will eventually ferment. At a minimum, the food needs to be changed once a week. If they empty before the week is over, they love your food! Go ahead and refill it so the hummingbirds will stay. 5. Clean the feeder each time you change the food. A simple rising and swirling of water in the feeder is all that is needed. Using soap is not required. 6. Never use red dye. There is no need to using red dye, it could be harmful to the birds. The hummingbirds will find the food. Most feeders have red on them, so it will help attract hummingbirds.